Haven't seen this much excitement in the audio world since John Hogan's introduction of "Less is More." For podcast creators not associated with a major corporation I'm expecting results to be the same. Ever get the feeling that Podcasts, for all the press received, will continue to be a "few players take all" industry? I've chosen to avoid USE of the term "podcast" for Audio Graphics' because 1) the sea of shows is a metaphor for bobbing in the ocean while waiting for audience, as you would a rescue plane; 2) podcasts, in general, have been attached to talk programming. 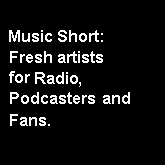 What Audio Graphics presents is different, a "Music Short" - new songs that deserve to be heard. Not much has changed since the following words appeared here. The moral: Before taking a dive into podcasting make sure you can tread water, and that you understand all the technical needs to produce and distribute. As nearly all words written about what podcasting holds, they are mostly said with wishful thinking. While you move over the list of positives that podcasting reportedly brings to advertisers, look for a mention of advertisers enjoying success with podcasts. It's a short mention, associated only with corporate distributed podcasts. Podcasting suffers from too high a number of podcasts, and that too many podcasts come from amateurs. While podcasts deliver a "highly defined audience," that's not reason enough for advertisers to use them. Other forms of media deliver a targeted base - magazines are a good example - but they are also suffering from too many outlets offering an audience as their product. Podcast advertising has to go through a long credibility-building process: It's audiences need to be quantified. Program providers need to stabilize their ranks. Advertising formats need to be created [beyond host-reads copy], and results documented so media buyers have justification for placing dollars with podcasts. So far all we've seen are a few names being used over and over again in the world of podcasts. Apple iTunes Podcasts, and Yahoo! Podcasts (shut down October 31, 2007) offer long listings of programs. But none of these are compiling the audience in a way that attracts advertiser attention (for any other than the branded podcasts of NPR, BBC, etc). Podcasting does hold promise for a few independents and many corporations. But there's more buzz coming from the people providing podcasts than there is from the people using podcasts, and that's a sign that podcasting is not yet ripe. There are many podcasts with few people listening. Generating revenue by harnessing an individual podcast's power is more elusive than with radio online. Like the falling tree in a forest: If a podcast is produced but not heard does it exist?